Burg Wachter Diplomat Wall Safes are designed to be set in re-enforced concrete. 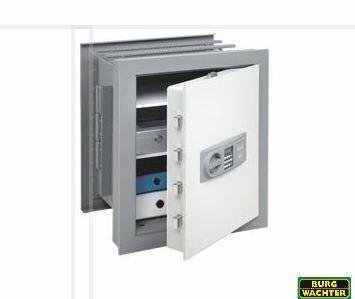 They provide protection for both business and domestic cash risks.Easily concealed, these safes have been independently tested and certified to EN1143-1 Grade 1. The doors are lined with fire protective material and are internally hinged to give a neat flush front.Steel re-enforcement bars are already welded onto the body to help ensure a solid fixing. Relocking devices secure door in case of attack. This range of safes come with a high security fingerscan biometric lock. This lock is VdS approved and has been certified by industry experts at ECB-S to the EN 1300 B standard. It supports up to 10 users and 24 fingerscans.